Holiday sales of Exciting Noise series apps! 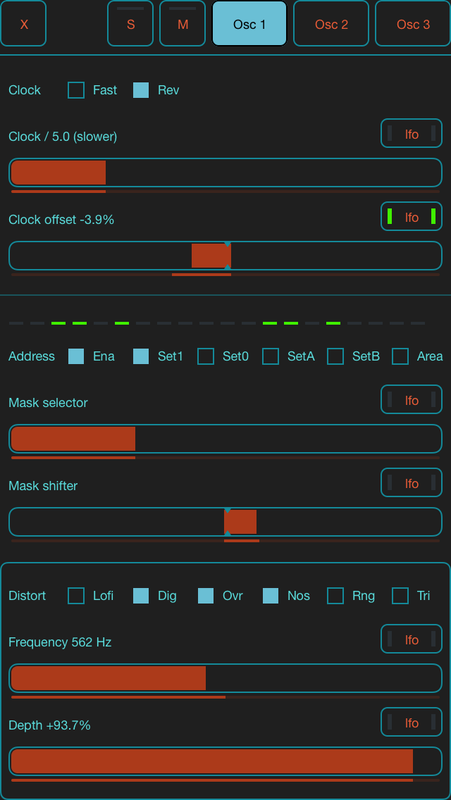 SoundScaper - An experimental sound mini lab for creating unusual soundscapes, atmospheric textures, drones, glitches and noises based on circuit bending ideas. 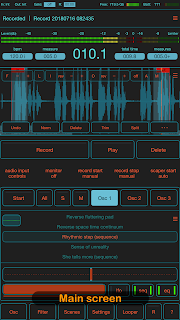 FieldScaper - Advanced field recorder combined with a sound warp engine and a collection of ready to use dynamic presets for iPad and iPhone. 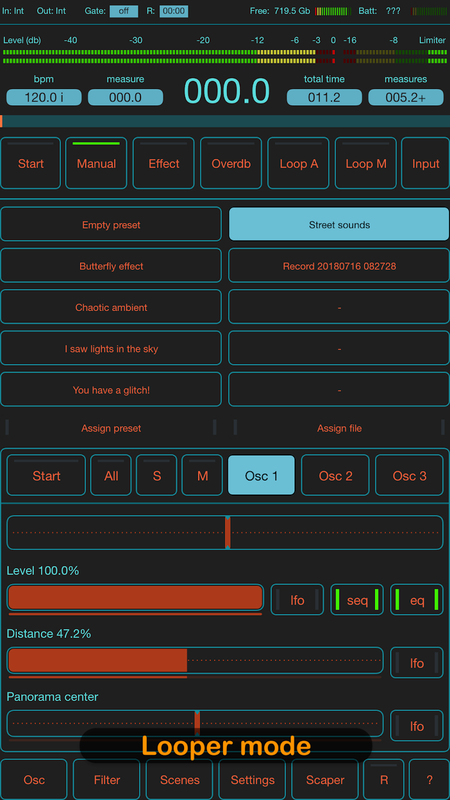 Discover new ways to create and construct unusual and exciting sounds from any environmental audio recordings or samples recorded from other apps through Inter-App audio or Audiobus. 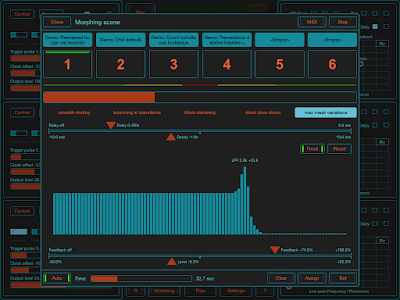 New version 1.5 of SoundScaper - an experimental sound mini lab has been released! Next version of SoundScaper 1.5 will have a significantly improved morphing scenes with additional effects. 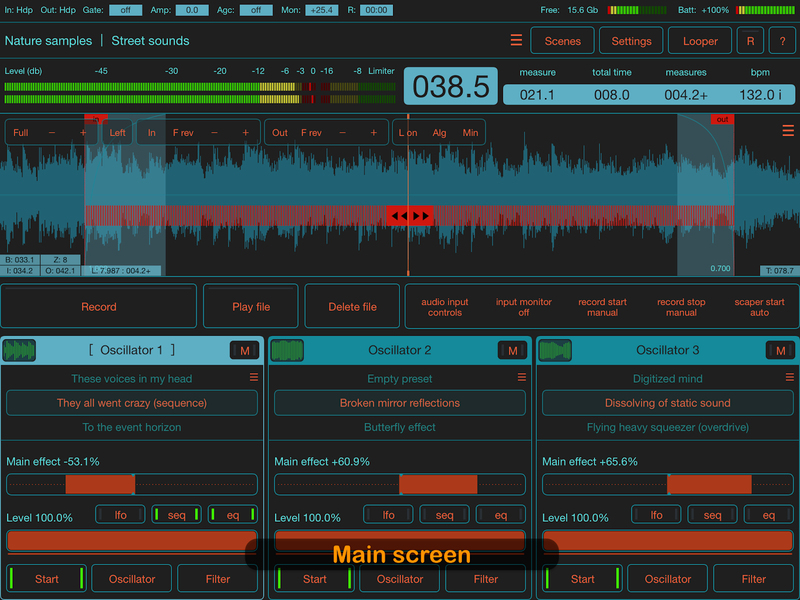 SoundScaper new morphing scene controls preview. Click on image to enlarge. 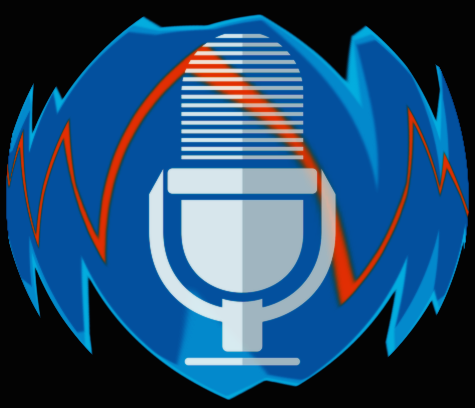 New version of SoundScaper 1.4.2 with bug fix has been released. Great performance with SoundScaper / FieldScaper and other iOS apps. Performing with iOS apps (including PhaseRings by Charles Martin), field recordings and fx pedals. Limited time sale in November! The first fully functional audio mastering application with professional quality delivers an unprecedented level of clarity, punch and warmth to your mix. Tape simulation recorder, player and effect for Inter-App Audio and Audiobus. Multipurpose effect processor for guitar, synthesizer and voice, providing a wide range of high-quality and creative effects options for audio processing. Using an external audio interface with iPhone/iPad can give you the best sound quality. But of course, external interface or dock station should have its own AD/DA converters better than built-in iPhone/iPad. This is especially important for recording or mastering process. Several famous reverb gears, everything with own unique presets and sounding. Update: This bug was fixed. New version 1.4.2 already submitted for review. It will be available soon. The new version 1.4 of SoundScaper app has been added very interesting feature morphing scenes. This feature gives possibility of smooth changing all parameters of current scene to another in auto or manual mode. Morphing not only changes the scene but also generates new sounding and effects in process of transition between them. This is realtime instrument that adds new ways of experiments with soundscape creation. - New feature morphing scenes in auto or manual mode. - Additional panel with scene hotkeys (you can doing morphing scenes or fast switching between scenes). 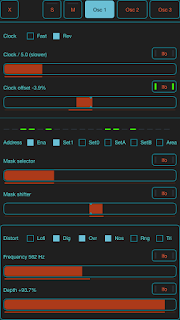 - Improved oscillator circuit filter mode. - Option for use standard midi commands. - Added record time counter. - Fixed midi start / stop in background. The upcoming version of SoundScaper 1.4 will have a new and very impressive feature "Morphing scenes". 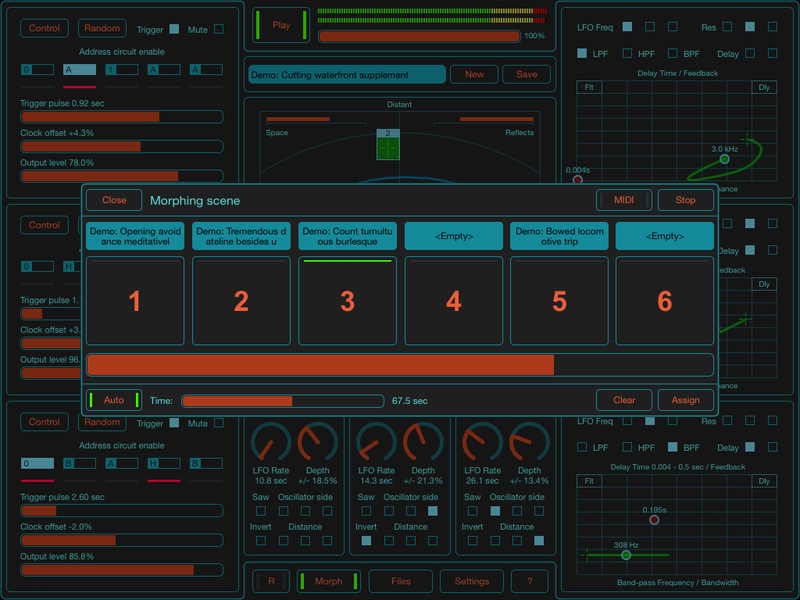 SoundScaper morphing scene controls preview. Click on image to enlarge. Specially designed for convenient use in real time and with MIDI controllers. Big buttons for quick scene selection and assigning MIDI command. Two powerful instruments for creation most unusual and exciting soundscapes in one bundle at a very reasonable price. 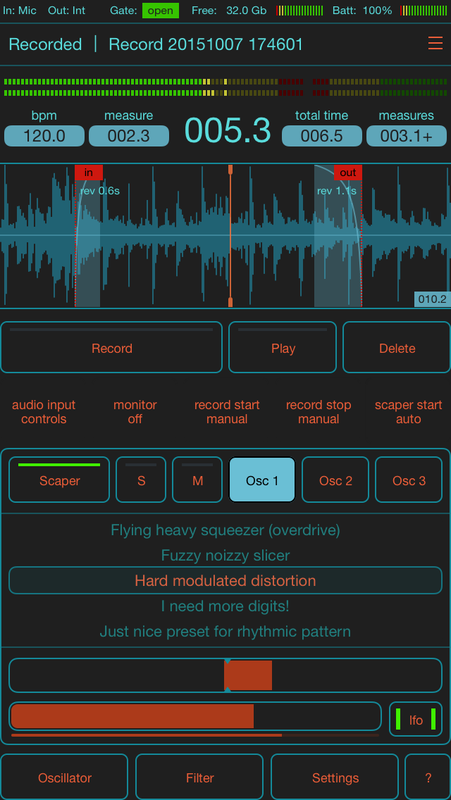 FieldScaper - Advanced field recorder combined with a sound warp engine and a collection of ready to use dynamic presets for iPad and iPhone. Discover new ways to create and construct unusual and exciting sounds from any environmental audio recordings or samples recorded from other apps through Inter-App audio or Audiobus. With this application you can easily experiment with creating new and unusual sounds from ordinary samples. For sound designers and those interested in creating ambient or experimental electronic music, with filtering and mixing of up to three oscillators, you can create excellent soundscapes, textures and drones for your music or for movie soundtrack or entertainment apps and games. 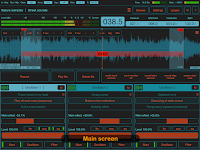 With complete MIDI control this application is very comfortable to use for real-time sound creation and at live performance. 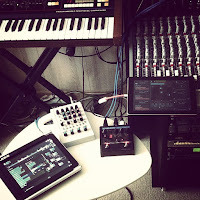 New Space Project, album performed on two iPad apps - SoundScaper and SunVox. In the second part of the show, we take a look at my app pick, a sound warp field recorder and scape constructor called FieldScaper from Igor Vasiliev. The app was made to shorten the way from recording samples to creating soundscapes; it’s also a great way to glitch out your music in a big way. I start out my demoing a recording that a made in the “field” and taking through a variety of presets. 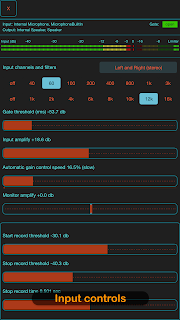 I talk about the some of the possibilities when you alter parameters within the app on your own and then dig deep into the power of FieldScaper by getting recordings into all three oscillators. From there, I put a more traditional recording of a drum loop from DM1 into FieldScaper and alter things in a glitchy kind of way. There’s so many sonic possibilities in FieldScaper that will open you to a world of new sounds – it’s really worth giving a try. For those of you that are already using FieldScaper, I’d love to know what you think – drop me a line and tell me what you think of FieldScaper. 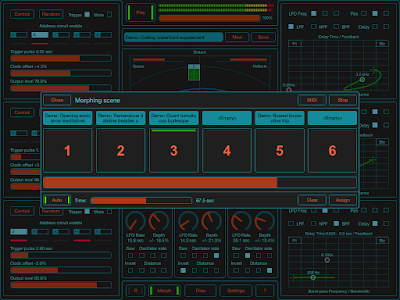 SoundScaper was bit of a departure from the more conventional audio effects processing apps Igor had previously released but it proved very popular with sound designers and more experimental electronic musicians. Indeed, so popular that, as I mentioned last week, Igor has now followed it up with FieldScaper – also a sound design tool but perhaps aimed more at capturing (and then processing) audio recorded ‘in the field’. In part two, I play a bit of piano and synth and mangle the tracks into some dark and eerie textures. In part one of a two part video review, I take a look at FieldScaper, a three track field recorder that allows you to mangle audio into some other worldly soundscapes. I go through all the effects and in part two, I perform a synth bit and warp it into something not of this earth. This is the same text that accessible with the button "?" in the FieldScaper but in single PDF file. 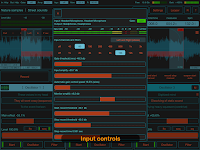 Lets go with another AppGiveaway, this time with many thanks to Igor Vasiliev we are giving away his most excellent FieldScaper – Sound warp field recorder and scape constructor App. So same rules as usual, all you need to do is answer the question below, please only one answer per person and the winners will be chosen at random on Monday 26th October 2015. Fix for iPhone 6s sample rate issue in this update. Also several significant improves including better performance for previous generation devices. Prima Nachschub aus einer probaten App-Schmiede für ambitionierte und fortgeschrittene Sound-Enthusiasten, die sich gerne auf etwas Besonderes und Hypermodernes einlassen. Experimentell, absolut abgehoben und am allerjüngsten Stand der Technik! Funkelnagelneu. Natürlich voll zum Törnen, versprochen! Damit ist es beispielsweise möglich, aus irgendwelchen Uralt-Mono-Recordings oder Soundschnipseln (Samples) völlig spacige Töne und Flächen herzustellen; aus einem der unten eingebetteten Videos (dem dritten) geht prima hervor, wie aus verrauschten Aufnahmen, die von einem antiken Kasettenrekorder (!) eingespielt werden, psychedelische und spooky Klangteppiche gestaltet werden können, also etwas komplett Anderes. And so first release and first problem. On the iPhone 6s there is problem with using internal mic. 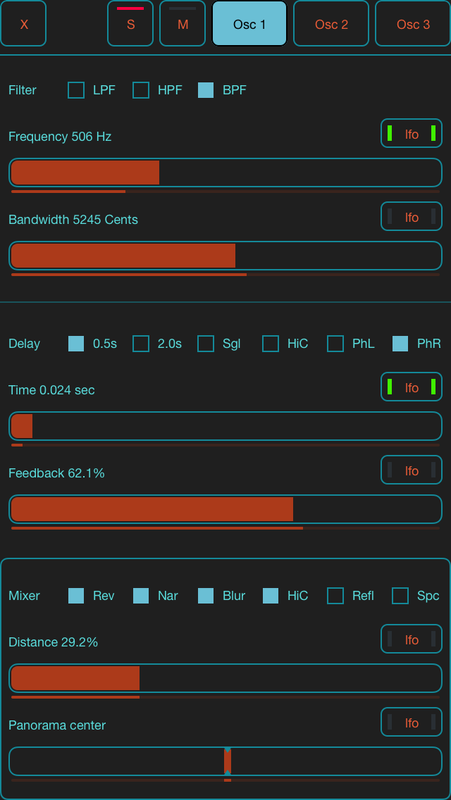 The hardware sample rate for internal mic is fixed at 48 kHz and app can't change it. With headset or external audio card all ok. Unfortunately the FieldScaper can't start without connected headphones on this device. But don't worry, I found and fix this issue. New version 1.1 already submitted for review and I asked for expedited review of this update. Will it be fast or as usual I don't know. But I hope they respond. - Improved user interface and sound engine. - Each oscillator start separately. - One oscillator can be started in loop mode, others playback samples. - File markers In and Out stored for each file. Tracks created with using FieldScaper app and with any others. 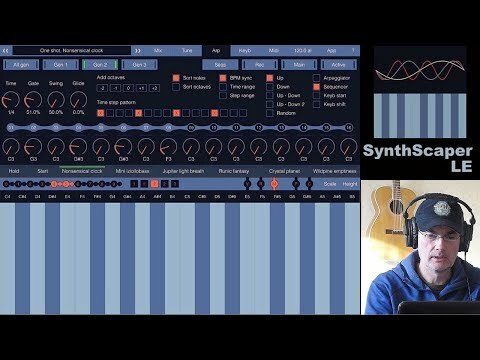 Great video for first start with FieldScaper app from thesoundtestroom. The main advantage is that you can record and modify samples along the way within the single app. You can record sounds and noises, delete unwanted parts and then use presets to give a whole new sounding or create spectacular soundscapes and textures to use them as loops in this app. And even use FieldScaper as effect in real time with other apps or external input. The FieldScaper consists of two main parts. The first part is the field recorder with special options for different ways of record environmental sound from microphone or record other sound sources. With the sample editor you can cut or split the source sample for more convenient use. The second part is the scaper sound engine that with using dynamic presets can easily transform the most ordinary sounds into something absolutely different. These parts connect with each other into one whole but you can use recorder or scaper independently. FieldScaper screenshots for iPhone. Click on image to enlarge. FieldScaper has different user interface for iPhone / iPad in portrait and landscape orientation. In portrait orientation the screen is divided between Recorder and Oscillator controls. 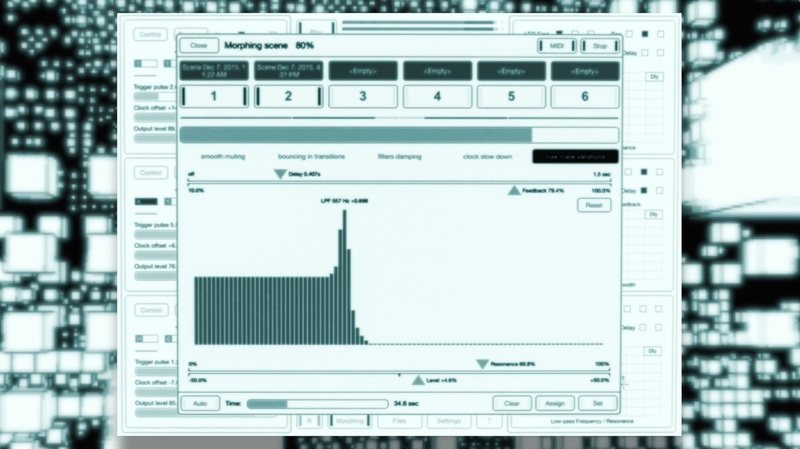 You can easily record new sample and immediately load and process it in the oscillator. For more convenient use of this application as field recorder on iPhone just rotate it to landscape orientation. 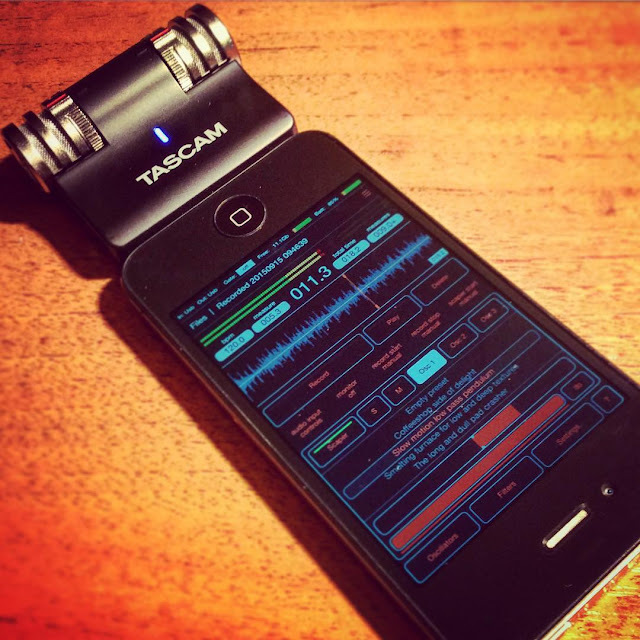 This transforms the user interface into full screen recorder without oscillator. This mode is very useful for recording and editing samples on iPhone. On iPad in landscape orientation on the screen placed the Recorder and controls for all three Oscillators. This mode is suitable for recording and operating with samples when you use FieldScaper in real-time as instrument with all three oscillators, especially with MIDI controllers. FieldScaper screenshots for iPad (landscape). Click on image to enlarge. 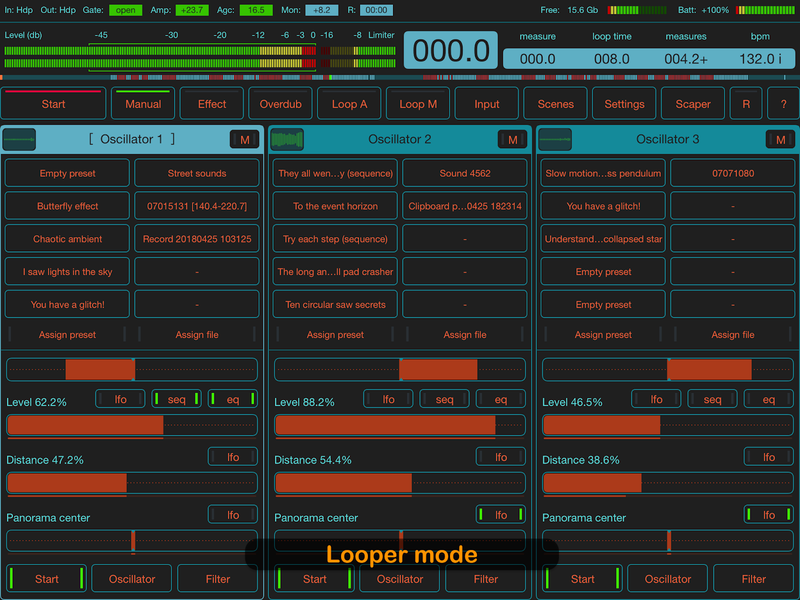 In addition you can switch the user interface to the mode of Looper. 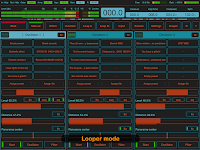 This mode is specially designed for use FieldScaper as real-time effect processor and looper. All controls are made so that you can quickly change presets and samples, use the main controls for oscillators and select the mode for processing the input signal. The scaper sound engine contains three sample-based oscillators each with filters, delay, distortion and a spatial mixer. Most of parameters can be assigned to individual low-frequency oscillators. You can control several these parameters in different ranges using the "Main effect" fader. These features give you the abilty to create continuously changing, breaking and glitching sound forms and loop-based effects from ordinary samples of synths, guitars, voices or everyday sounds of your environment. The FieldScaper supports complete MIDI control for all faders, knobs and many buttons. You can change the parameters of oscillators, filters, delays and mixer by using any external MIDI controller or MIDI apps like sequencers. 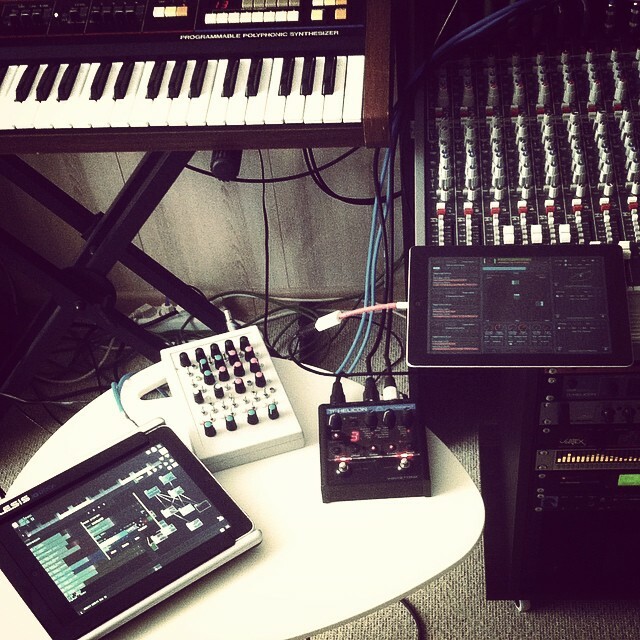 With the MIDI controllers this app becomes very comfortable to use at live performance. Auto start record when input signal appears. 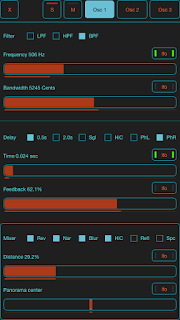 Auto stop record when signal below threshold or by time. Record series of samples by a signal presence. Recorder timer in seconds or measure (sync with BPM). Input signal monitor with different modes. Automatic gain control, cut off input filters and noise gate. Advanced sample editor (delete, trim, split, cut, copy, paste, undo). Filter and normalizer for recorded sample. Loop based mode for processing input in real time as effect. Three sample-based oscillators, each with set of effects. Low-pass, high-pass, band-pass, band-stop filters with resonance. Two range delay with smooth time change and additional modes. Advanced spatial mixer / reverb with changing of side and distance. Three-band parametric equalizer for each oscillator. Wide range changing of oscillator speed with option of reverse. Distortion effect based on breaking addressing of samples (like on circuit bending). Complex effect contains lofi, overload, noise, ringmod, flanger, phaser. Step sequencer can control selected parameter and envelope generator (ADSR). Individual or group of LFO for each effect with additional modes and BPM sync. The "Main effect" function for control several parameters simultaneously. A set of predefined presets with wide range of effects. Scenes for storing and loading all operation parameters. Pack the scene and all its samples and presets to single file. Convenient file manager with groups of files by name or date. Access samples and records via standard iOS app "Files". Upload samples thru Dropbox, Web access, "Open in" and clipboard. Complete MIDI control for all faders, knobs and other modes. Adaptive UI for portrait and landscape orientation. Different color schemes available for UI. Detailed application description (built-in and PDF file). Supports Audiobus 3 with "State Saving" and MIDI features. Supports Ableton Link with start / stop sync. Fourth generation of iPad or fifth generation of iPhone and higher is required. 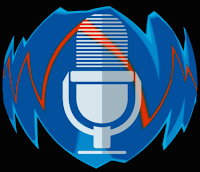 In this demo the FieldScaper app used as sample recorder with auto start and stop recording. Then the sample was divided on two oscillators and processed independently with two various standard presets. The third oscillator used as looper for external synth with glitch like preset. Several parameters are changing in real time by external MIDI controller. And don't miss new experimental sound instrument - FieldScaper - Sound warp field recorder and scape constructor. Coming soon! 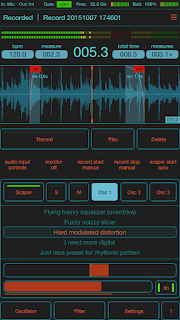 FieldScaper - Sound warp field recorder and scape constructor has been submitted for review. Advanced field recorder combined with sound warp engine with a collection of ready to use dynamic presets for iPad and iPhone. Discover new ways to create and construct unusual and exciting sounds from any environmental audio recordings or samples recorded from other apps through Inter-App audio or Audiobus. 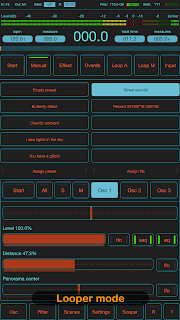 The main purpose of this advanced app is to shorten the way from recording samples to create spectacular soundscapes and in addition to use this app as glitch loop based effect in the real-time. The FieldScaper consists of two main parts. The first part is the field recorder with special options for different ways of record environmental sound from microphone or record other sound sources. The second part is the scaper sound engine that with using dynamic presets can easily transform the most ordinary samples into something absolutely different. These parts connect with each other into one whole but you can use recorder or scaper separately. 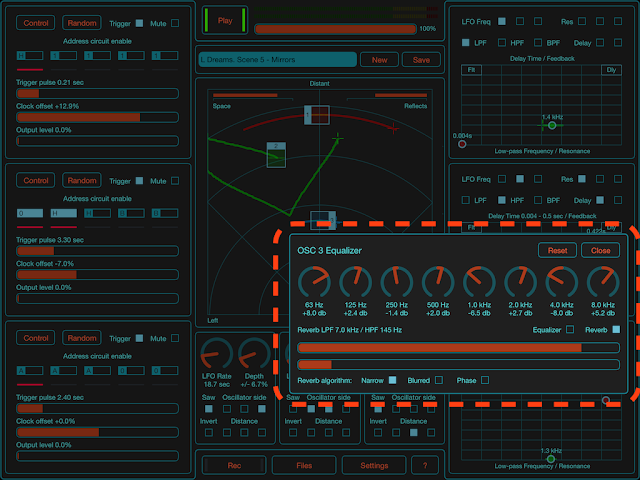 The scaper sound engine contains three sample-based oscillators each with filters, delay, distortion and spatial mixer. The most of parameters can be assigned on individual low-frequency oscillators. With using the "Main effect" fader you can control several these parameters in different ranges. These features give you the abilty to create continuously changing, breaking and glitching sound forms and loop-based effects from ordinary samples of synths, guitars, voices or everyday sounds of the environment. FieldScaper supports complete MIDI control for all faders, knobs and many buttons. You can change the parameters of oscillators, filters, delays and mixer by using any external MIDI controller or MIDI apps like sequencers. With the MIDI controllers this app becomes very comfortable to use at live performance. 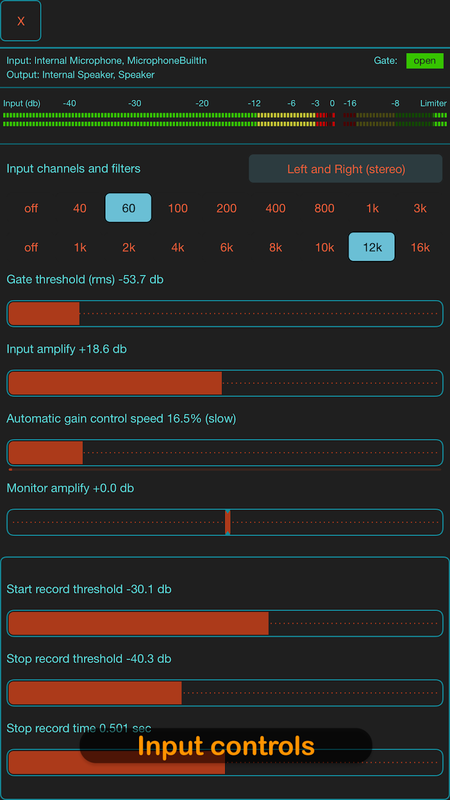 FieldScaper - Sound warp field recorder and scape constructor. Advanced field recorder combined with sound warp engine with an extensive collection of ready to use dynamic presets lets you discover new ways to create and construct unusual and exciting sounds from any environmental audio recordings or samples recorded from other apps. 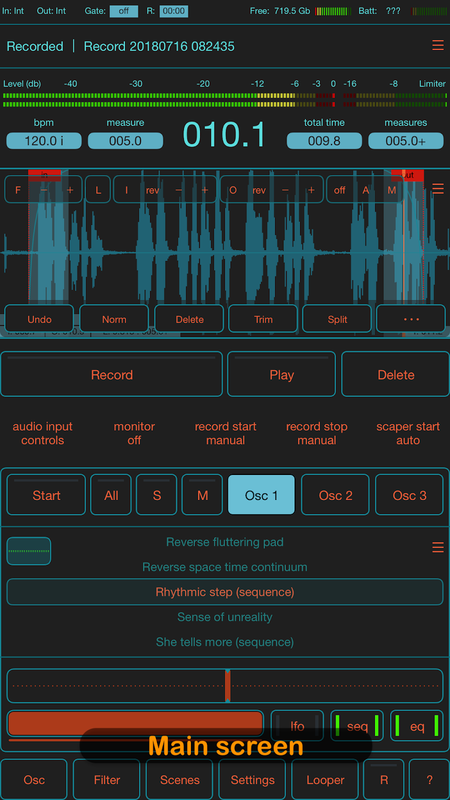 Before it will be released you can use another experimental sound app SoundScaper. The big collection of tracks and sounds created with using SoundScaper and other apps and even hardware synths and DIY devices. Very diverse and interesting compositions. Many are very impressive! Whether you’re 8 years old or 80 years old, there’s never a bad time to start making music. You live in exciting times, with technology that allows you to carry around a virtual studio in your pocket or purse. It’s never been easier or more fun to learn how to create your own songs and share them with your friends, or the whole world. 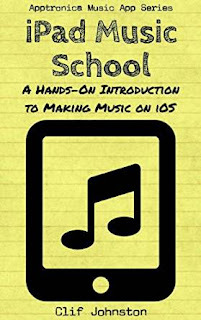 This book is for anyone wanting to learn how to make music with apps on your iPad. If you’ve never played a note in your life, I’ll show you how to make your first song in minutes. If you’re an experienced musician looking for a quick start on music app basics, you’ll also find useful information in this book. iPad Music School starts by showing you how to make and share your first song using a single app. From there you'll learn about copy and pasting audio between apps, recording your own sounds, and managing your files. You'll discover how easy it is to connect apps together using Inter-App Audio and Audiobus. You'll also learn how to sync two apps together and send notes between them using virtual MIDI. By the time you finish this book, you'll have a solid foundation in all of the concepts you need to move on to making your own great music with iPad apps. 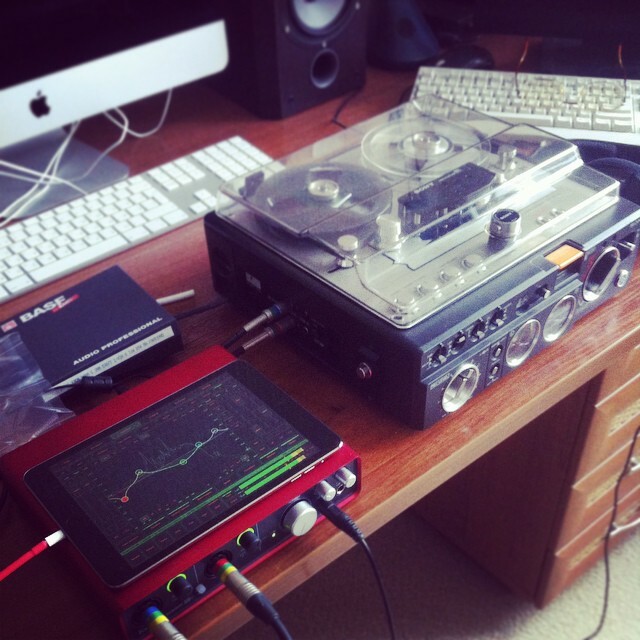 This album was performed on two iPad apps - SoundScaper and SunVox. Basically all tracks were performed by using only these apps, but certain textures were recorded by using several DIY sound generating devices. Source samples were created special for SoundScaper app by using several digital and analogue synthesizers and effect units. 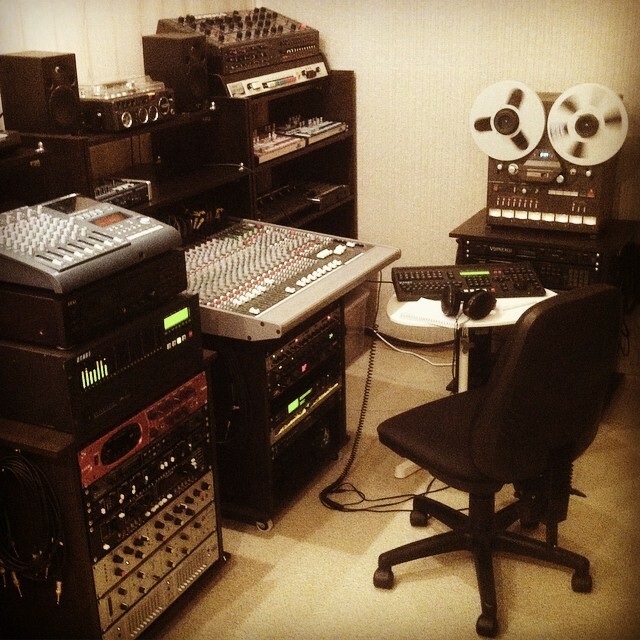 All recordings were made with analogue mixing console on multitrack tape machine. Final mix also was made on the two track tape. 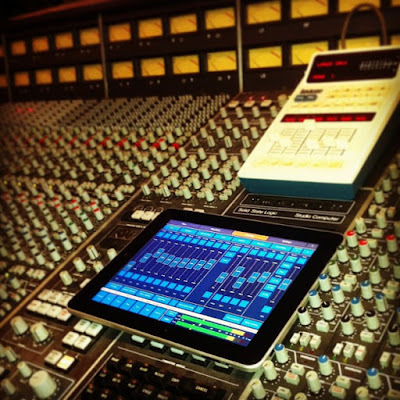 Digitizing and post processing on iPad with apps Master Record and Audio Mastering. Mystical trip to the depth of mind. Improvisation with iPad app Virtual ANS and several DIY sound generating devices. Recorded live in one session. Produced, Recorded and Mixed by: Igor Vasiliev and Alexander Zolotov. SoundScaper 1.3 has been released! 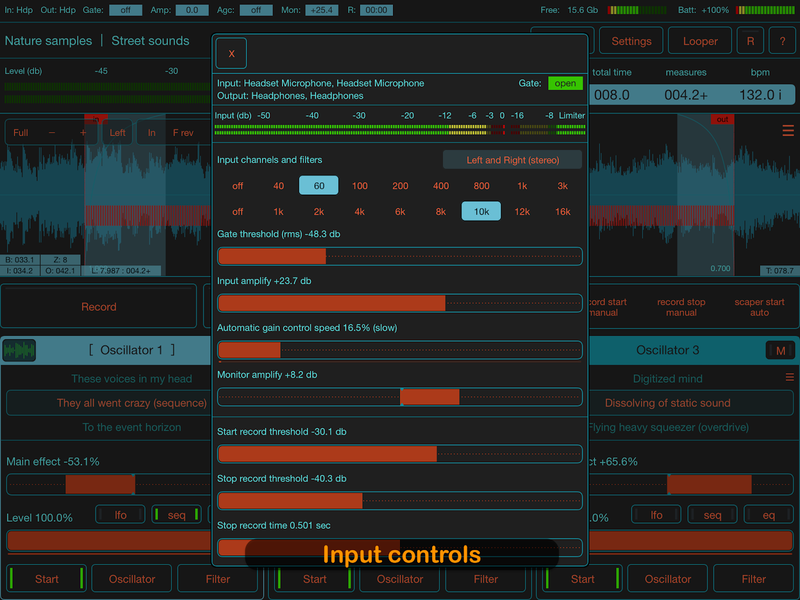 New version 1.3 of SoundScaper contains extended options for the sound sources in spatial mixer. Advanced control panel by double tap on the sound sources in mixer. Eight band equalizer for each sound source. LP and HP filters in reverb for each sound source. Additional reverb algorithm modes for sound sources. In the new version you can open advanced control panel by double tap to the mixer sources. This panel contains eight-band equalizer which connected after filter and delay modules and before reverb unit. By default equalizer is off. Also this panel contains two faders at the bottom for changing frequency of the low-pass and high-pass filters for reverb signal (reverb reflections, not for source signal). There are three buttons for modifying reverberation algorithm for each sound sources. Different algorithm modes for different sound sources in common reverb space can give very unusual sounding. Experimenting with these modes for different sounds you can reach spatial effects which would be more suitable for your soundscape ideas.